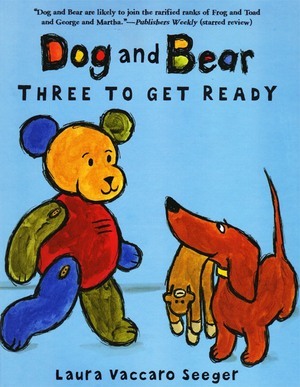 Dog and Bear,Three to Get Ready by Laura Vaccaro Seeger. A Neal Porter Book, Roaring Brook Press, New York, NY 2009. Three to Get Ready is the third book in the delightful Dog and Bear series that began with Two Friends, Three Stories and Two’s Company. These engaging pals are at it again, getting into trouble, being confused but always, in the end, helping each other and being best friends. A new installment just released this past July, Dog and Bear, Tricks and Treats, is a Halloween book. If you haven’t seen these books, get to your library or bookstore at once. The humorous antics of the two friends and the jams they get into will delight the youngest child. New readers will thrill to the fact that they are able to read the spare text. I was impressed that Vaccaro’s illustrations, that at first glance look deceptively simple, brilliantly depict the love the two best friends have for each other. And this is what is so pleasing about these little stories. Whether it’s dog helping bear get a bucket off his head or bear preparing a soft spot on the floor when dog is jumping on the bed and is sure to fall, these two pals care about each other and demonstrate unending empathy for each other.